"Everything's possible. We have the hyperlight drive, which the Mechanicus claimed was a practical impossibility. I've seen space bend, time fold in on itself, and energy flow like water. Perhaps one day we'll see no more wars, no more lines across the galaxy for us to fight over. We have to hope." The following weapons and equipment are available to marines of the Furies chapter in addition to the items listed in the Space Marine Armoury section of Codex Space Marines. The same restrictions apply: a character may select two single-handed weapons, or one single-handed and one two-handed weapon, and may also have up to 100 points of wargear. Weapons marked with a '*' may be used by characters wearing Terminator armour. See the Wargear section for details of new weapons and wargear. Any Furies vehicle apart from bikes and dreadnoughts can have the following equipment in addition to the items listed in Codex Space Marines. Some of these items have restrictions on the equipment they can be used in conjunction with. See the Furies Wargear section for further details. Although the Furies are no longer an Imperial marine chapter, they have not lost their dedication to their cause. Furies follow the same rules for regrouping as do normal marines. Furies heavy cruisers are fitted with orbital deployment systems, including drop pods and retrieval systems. A Furies army may choose to deploy using drop pods in any battle where the Deep Strike rules are used. Note that the same restrictions apply regarding which units can use drop pods. Furies armies rely less on heavy support vehicles than many marine chapters. To represent this, a Furies army may not contain more vehicles chosen from the heavy support section than units selected from the troops section. For example, if the army contains two troops choices, it may only contain two heavy support vehicles, even if the mission force chart allows three heavy support choices. Note that Devastator squads are not vehicles, and are not affected by this restriction. The following rules describe how the equipment used exclusively by the Furies marine chapter works during a battle. 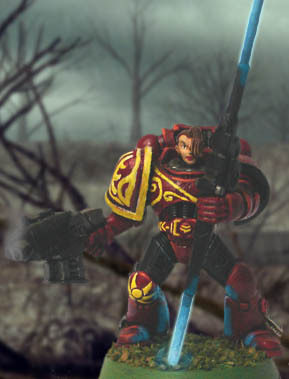 The Furies also have access to all the equipment used by all marine chapters, as described in the Space Marine Wargear section of Codex Space Marines. Artemis Bow: An Artemis bow is an advanced energy weapon capable of firing at short- to mid-range, or of generating a disruptor field in close combat. The bow counts as a storm bolter when firing, and as a power weapon during close combat. Note that the bow can be used in conjunction with another close combat weapon to gain the +1A bonus for additional close combat weapons. Destructor Gauntlet: A Destructor is a power fist with a built-in grenade launcher. Grenades may be fired as normal, using all the rules that apply to normal grenade launchers. In close combat the gauntlet counts as a normal power fist. Enhanced Armour Feedback: Furies power armour uses fibre bundles to move itself in response to the movements of the wearer. Alliance engineers have found several ways to increase the efficiency of these fibre bundles, giving power armour an effectively instantaneous feedback to its wearer's movements. A model wearing power or artificer armour with enhanced feedback gains +1 Initiative. Huntress: Huntress is a special system of sensors and feedback adjustors built into power or Terminator armour. It allows the wearer to traverse difficult terrain with ease, as the armour automatically adjusts to the uneven ground. A model wearing armour with a Huntress system ignores the effect of Difficult terrain on movement, and may move through it as if it were open ground. If a Huntress system is used by a character leading a squad, or an independent character permanently assigned to a squad, then the other squad members may be given Huntress systems at an additional cost of +5 points each. Huntress can only be used in power, artificer or Terminator armour, and has no effect on models not travelling on foot. Matrix Armour: Matrix or Alignment armour used sub-molecular alignment technology to create a retractable armour system that, when engaged, has strength equivalent to power armour. This technology can be incorporated into power armour to reinforce damaged or vulnerable areas of the suit when impact is sustained. A model wearing power armour (standard or artificer) may take Matrix armour as an upgrade. The model may reroll its first failed armour save during the game. Note that Matrix armur cannot be used in conjunction with Scout or Terminator armour. Ship-to-surface Link: Alliance marines often use information gathered by the long-range sensors of orbiting starships to aid them on the battlefield. A ship-to-surface link may be taken by any Veteran Sergeant. The sergeant's squad may reroll one missed to-hit shooting roll per turn, exactly as if the squad were accompanied by a Techmarine with a Signum. Note that although the cost of the Link is considered to apply to the sergeant, any member of the squad may carry the Link equipment. Silver Arrows: Silver arrows are a special type of boltgun ammunition containing a compact disruptor field generator. Silver arrows can be used in boltguns, bolt pistols or storm bolters. They allow no armour save to be made against hits in the shooting phase. In close combat a pistol with silver arrow ammunition has no special effect. Warp Displacer: Psykers draw their power from the warp, channelling it through their own minds and into realspace. Warp displacers misalign realspace and warpspace over a localised area, making it very difficult to draw power from the warp. Any psykers within 36" of a model carrying a warp displacer suffer a -3 modifier to their Ld tests to use psychic powers, with an additional -1 modifier for each psyker within 12" of their own position. An army with a warp displacer may not contain any psykers of its own. Ceramite Heat Shielding: Ceramite is a ceramic heat-absorbent material. When used as a coating on armour, it reduces the effect of heat-based weaponry. Melta weapons do not count their extra D6 at close range when trying to penetrate ceramite-coated armour. Note that because ceramite it not an actual armour layer, it can be used in conjunction with the Extra Armour upgrade. Infra-red Targeting Array: Only useful during night missions. An infra-red array allows a vehicle to locate targets within 24" and fire on them without having to test for the range of their vision. Infra-red arrays cannot target troops behind solid (4+) cover. Note that the array does not function like a searchlight: other troops cannot fire on the array's target without testing their vision range normally, nor can the vehicle using the array be targeted automatically.